The first Indian attempting to sail around the world solo will reach Christchurch tomorrow morning for a short stop-over. The six sails on the yacht of Commander Dilip Donde of the Indian Navy are made in New Zealand. The Commander left Mumbai in the INSV Mhadei on 19 August this year, commencing the first ever attempt by an Indian to circumnavigate the globe by sail. He left Freemantle, Australia on 1 Nov for his second leg that will see him covering nearly 3300 nautical miles in about 22 days. The local Sikh community has prepared a warm welcome for the sailor when he berths at Lyttelton tomorrow at around 10 am. From Christchurch the Commander sails to Falkland Islands and Cape of Good Hope in South Africa before arriving back in Mumbai on or about 25 May 2010. A ROYAL MESS: Barbora said red-tapism and Government inefficiency are jeopardising defence. 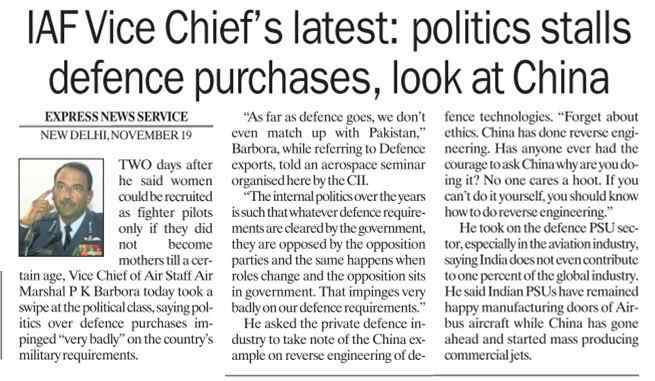 New Delhi: For the second time in a week Vice-Chief of Air Staff PK Barbora has hit the headlines. After being openly unapologetic for setting off a storm by terming women a liability for the military, on Thursday, Barbora lashed out at politicians, saying that red-tapism and Government inefficiency are jeopardising India's military preparedness. He has accused politicians in India of making a "royal mess" of India's defence. Air Marshall Barbora said, "The Government clears something, the Opposition immediately says no. When they change roles, the same thing happens. That impinges very badly on India's defence." He also hit out at the slothful socialist culture promoting inefficient public sector undertakings, which he felt were a set back for India's military preparedness. "We go for outright direct purchase, and the seller is very happy. At their (foreign suppliers) mercy, the tap can be turned off and the tap can be turned on," said Barbora. Defence analysts say that in a stiff world of spit and polish, the IAF's number two man - Air Marshal PK Barbora - is quite the find, a character. 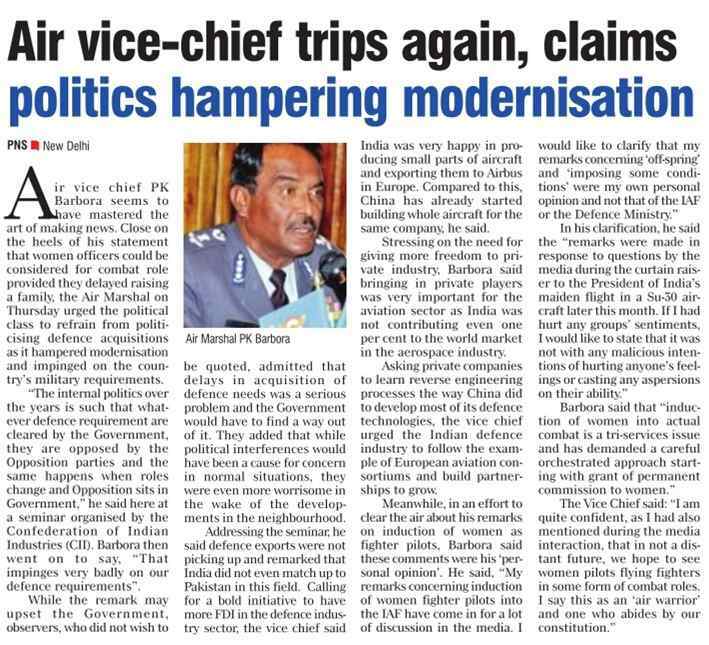 In a system which frowns on candour and outspokenness, Air Marshal Barbora stands out for speaking his mind. The jury is still out on whether he's simply a maverick or an intrepid general who is willing to stick his neck out in national interest. ON THE STAND: IAF Vice Chief Air Marshal PK Barbora offered his apologies if anyone's feelings have been hurt by his remarks. 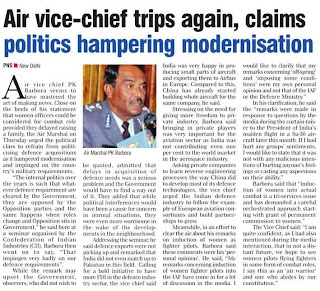 New Delhi: The Indian Air Force (IAF) Vice Chief, Air Marshal PK Barbora on Thursday offered his apologies if anyone's feelings have been hurt by his remarks on induction of women fighter pilots, and stressed that the views were his own and not an official policy. In a statement, Barbora clarified that his remarks about women fighter pilots not having "offspring" and about "imposing some conditions" on their service reflected his own opinion and not of the IAF. "I would like to clarify that my remarks concerning 'off-spring' and 'imposing some conditions' were my own personal opinion and not that of the IAF or the MoD (Ministry of Defence)," said Barbora on Thursday. "If I had hurt any groups' sentiments, I would like to state that it was not with any malicious intentions of hurting anyone's feelings or casting any aspersions on their ability," he added. Barbora said that the induction of women into actual combat roles is a tri-services issue and demands a careful orchestrated approach starting with grant of permanent commission to women. "Considering many variables such as our country's societal environmental and cultural ethos of respect and status of women, a step by step approach would be the preferred option in respect of employability of women in the defence forces," he said. "I am quite confident, as I had also mentioned during the media interaction, that in not a distant future, we hope to see women pilots flying fighters in some form of combat roles. I say this as an 'air warrior' and one who abides by our constitution," he added. 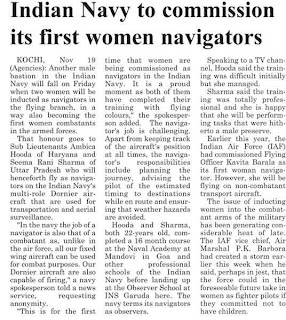 During a curtain raiser before President Pratibha Patil's Sukhoi-30 MKI's flight, Barbora said on Tuesday that inducting women pilots in the fighter stream will take a while and certain preconditions might be laid down before they are allowed to become fighter pilots. "We can induct women fighter pilots for show purposes. But we spend exorbitant amount on training fighter pilots, and if we are not able to utilise them optimally, it may not be prudent to have women fighter pilots at the moment," Barbora told reporters. "Once the lady goes the family way, she will be off flying for 10 months. And when we have invested so much, it is not a fruitful development," he added. "We may say (if women are allowed in the fighter stream) that till this age, you can be happily married but do not go for pregnancy till that time. After 14-15 years of service, the value (of the money invested) is recovered.... We are just looking into the area. Even for men, we do not allow them to leave the service before a certain period of time," Barbora added. The IAF currently has 784 women officers working in various fields, barring the fighter stream. TERROR TRAIL: Headley and Rana were arrested in October at the O'Hare airport in Chicago. New York: Some serving and ex-military officers are among five people arrested in Pakistan in connection with the LeT plot to carry out a major terror attack in India using American national David Coleman Headley, a media report said on Thursday. "Pakistani authorities had arrested as many as five other people in connection with the (Lashkar-e-Toiba) plot in recent weeks, including some former or current Pakistani military officials," the New York Times reported. Headley, 49, and Tahawwur Hussain Rana, 48, who were arrested last month by FBI are accused of plotting terror attacks on behest of LeT against India and a Danish newspaper. "The arrests of Headley and Rana have widened into a global terrorism inquiry that has led to arrests in Pakistan and implicated a former Pakistani military officer as a co-conspirator," the paper quoted officials as saying. The American intelligence officials believe that some Pakistani military and intelligence officials even encourage terrorists to attack what they see as Pakistan's enemies, including targets in India, it said. Headley and Rana were accused in the FBI complaints of reporting to Ilyas Kashmiri, a former Pakistani military officer who has become a militant commander associated with both al-Qaeda and Lashkar-e-Toiba. The case is one of the first criminal cases in which the federal authorities seem to have directly linked terrorism suspects in the US to a former Pakistani military officer, though they have long suspected connections between extremists and many members of the Pakistani military, the paper said. A spokesman for the Pakistani Embassy in Washington, however, declined to comment on the arrests, citing the continuing inquiry. Headley, according to the FBI charge sheet, was being used by the Lashkar-e-Toiba (LeT) to target among others the National Defence College in New Delhi. The officials, who asked not to be identified because they were discussing a continuing inquiry, said that the FBI investigation has widened further in part because of the wealth of information supplied by Headley, the paper said. The officials declined to name the other Pakistani military officer - who held the rank of colonel or brigadier general before leaving the army recently -- in the case, who is suspected as a co-conspirator, the NYT said. In the complaints against Headley and Rana, the officer is identified as an uncharged conspirator by the letters 'A' and 'B'. The complaints describe him as "associated with Kashmiri, as well as with Lashkar-e-Toiba." 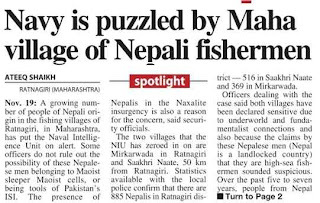 Due to Armed Forces Act, human rights violation has been inflicted on the people Northeast. For how long can the civilians live under the shadows of militant groups, inefficient state govts and constant violation of human rights by armed forces? SOMETIMES IN moments of solitude, I can't help but ponder deep down and often found asking myself the inevitable question. Are we, India as a nation, really independent in the true sense of the word? In spite of attainment of independence way back in 1947, I strongly can't help but feel we still need to go a long way in becoming an independent nation in its truest sense. There seems to be inequality and discrimination existing everywhere in our nation. I still am groping for answers in the dark as to why our country still continues to be like this even after 62 years of being an independent nation and the largest democracy in the world. I hail from the Northeast part of India and as a result I have been a witness to first hand account of Human Rights violations inflicted upon the people of this region for the past 50 years, since the inception of Armed Forces Special Power Act (AFSPA), 1958. Since I have been a part of this forgotten region and have been exposed to gross violation of human rights inflicted upon an individual. I strongly feel the importance of bringing this issue to the forefront so that painful stories of ripping off an individual's right to existence are stopped for once and for all. It has been more than 50 years since the Northeastern Region has been living under the shadows of AFSPA, 1958 (Arm Forces Special Power Act), which was first implemented in the Northeastern states of Assam and Manipur and was later on extended to Meghalaya, Nagaland, Mizoram, Arunachal Pradesh and Tripura after the amendment of the Act in 1972. A grave crime - 50 long years of violation of Human Rights has been perpetrated in the region due to the special powers vested in the Army by the Act. Misuse of power by the security personnel has led to untold violations of an individual's right to life. Even if Northeast is a 'disturbed area', there is no justification for the Human Rights abuses being carried out by the military in the region. The Act is unconstitutional and undemocratic. It violates Article 21- Right to Life of the Indian Constitution. The Act violates Universal Declaration of Human Rights, the International Covenant on Civil and Political Rights (the ICCPR), the Convention Against Torture, the UN Code of Conduct for Law Enforcement Officials, the UN Principles for Protection of All Persons Under any form of Detention. When an individual is born, he or she is being protected by a basic right - the right to life. It is our birthright, we are born with it (the right to life), no Act or law or organisation or militant (insurgency) group or an individual can take that away from an individual. It is above any law and I implore everyone to fearlessly fight for your right to existence irrespective of your caste, creed, gender, religion and race. Nobody has an iota of right to take it away from you and there can never be any justification for such an act. c) Privilege to seek judicial redress. It's surprising to note that some parts of the country are subjected to a specific act to the extent of empowering the act to violate basic human rights while the rest of the country enjoys protection guaranteed under the constitution. Does it not contradict and suppress the very essence of Article 14 of the Indian Constitution? Are we, the citizens of India, not concerned about upholding and respecting our own constitution? According to AFSPA of 1958, security personnel even the rank of Havildar is entrusted with special powers to carry out operations in an area, which is declared disturbed. The power comes in the form of right to shoot to kill any individual to maintain public order, which can be based on suspicion. The objective of the Act might be to maintain public order. However, there have been innumerable incidents of gross misuse of power resulting in human rights violation due to unaccounted power vested in the security personnel by this Act. As a consequence, the Act, which was meant to aid civil power, has become an instrument of human rights violation and discrimination. The internal problems, that the various states of North-East are embroiled in, must be addressed politically and not militarily because unaccounted and indiscriminate use of brute force will further alienate the people of North-East and subsequently acts as a catalyst to growth of insurgency in the region. The situation has now become a vicious cycle. To win the faith of the people of North- East in the ability of the government to govern in democratic lines, the Armed Forces Special Powers Act must be repealed and instead we should concentrate on reaching a political solution. In the process state governments should act responsibly and should sincerely endeavor to improve their own system of governance. 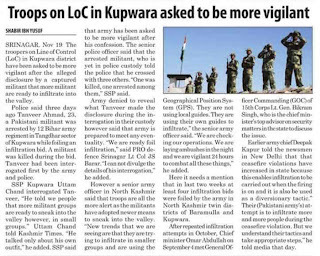 For how long can the civilians live under the shadows of militant groups, inefficient state governments and constant violation of human rights by armed forces due to AFSPA? This has to be stopped somewhere and let this be the beginning of an end of violation. 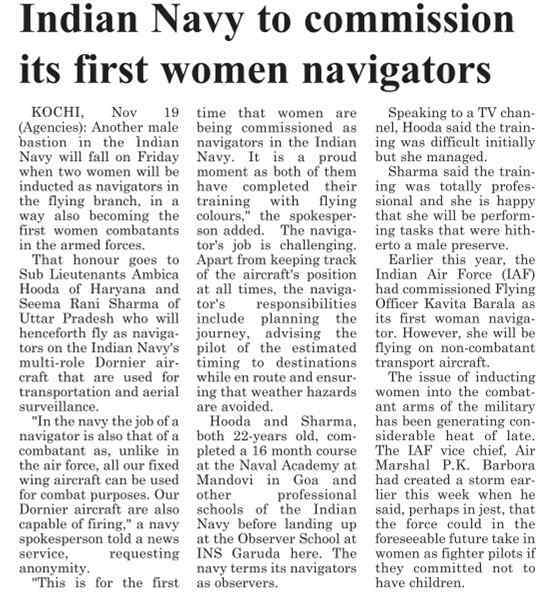 Vice Air Chief P K Barbora, who hit the headlines on women fighter pilots, has done it again. He attacked America and China on Thursday. This time he is training his guns on the United States and growing Indo-US ties with the former US secretary of Defence William Cohen in attendance. "I do not understand the distinction between old democracy and biggest democracy. The US has realised the importance of India after 9/11," said Vice Chief of Air Staff. And China was his next target. 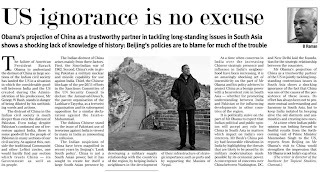 "Forget morality, right and wrong, the way China has been doing reverse engineering, can anyone say anything to China? We should also for own progress do the same," he added. The Vice Chief's outburst against the US didn't go unanswered. "Our relations weren't good with India, but now they have improved. 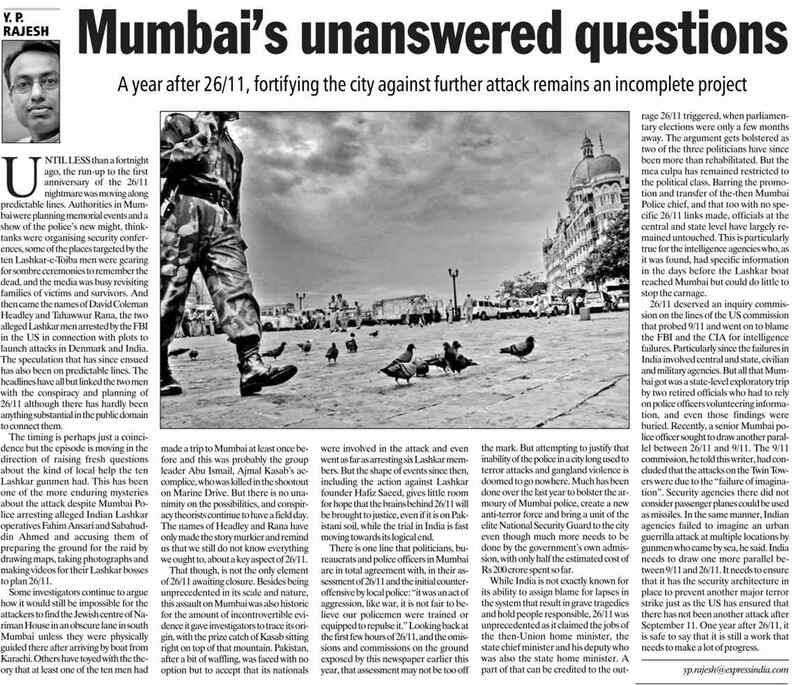 Even India realised our importance after 26/11," said William Cohen. 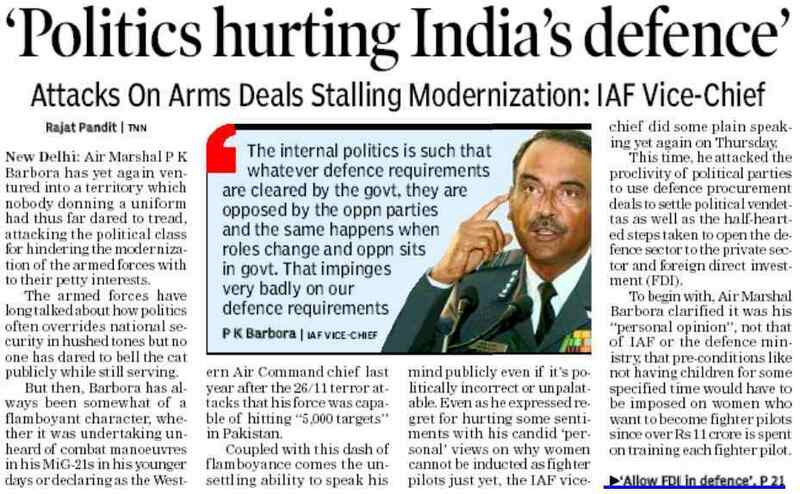 The Vice Chief of Air staff may be saying what many Indians feel. But after the remarks coming from a serving senior officer, the Air Force will have to do a lot of explaining. 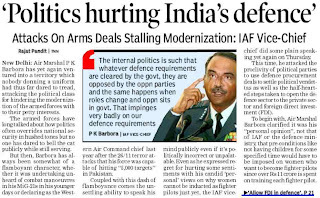 The Vice Chief of the IAF, Air Marshal PK Barbora, today dropped a proverbial bombshell. He summarised that "politics" over defence purchases impinged on the country's military requirements and plans to buy new equipment. In a way he blamed the entire political class of stalling defence projects just to hit out at political opponents. Making some of the most forthright comments, Barbora said: "Internal politics over the years is such that whatever defence requirements are cleared by the government, they are opposed by the opposition parties and the same happens when roles change and opposition sits in the government." 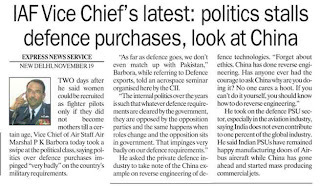 "All this impinges very badly on our defence requirements," he told said at a seminar 'Energising aviation sector in India' organised by the CII. Barbora also painted a dismal picture about the country's defence exports saying: "We don't even match up with Pakistan." 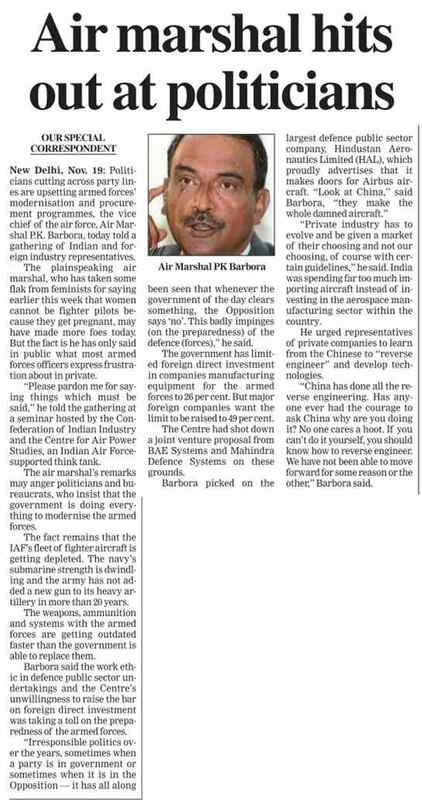 On the present status of the country's capabilities in the aerospace sector, he said India was happy producing small parts of aircraft and exporting them to Airbus in Europe, but China has already started building whole aircraft for the same company. Air Marshall Barbora asked the private companies to learn reverse engineering processes the way China did to develop most of its defence technologies. "Forget about ethics. China has done all the reverse engineering. Has anyone ever had the courage to ask China why are you doing it? No one cares a hoot. If you can't do it yourself, you should know how to do reverse engineering." Notably two days after he had created a major controversy with his comments over induction of women as fighter pilots, Barbora today issued an apology saying: "My remarks concerning induction of women fighter pilots into the IAF have come in for a lot of discussion in the media. I would like to clarify that my remarks concerning 'off-spring' and 'imposing some conditions' were my own personal opinion and not that of the IAF or the Defence Ministry." The Obama Administration should endorse India's membership to a permanent seat in the UN Security Council during the state visit of Indian Prime Minister Manmohan Singh scheduled next week, a noted American scholar said on Wednesday. "The Obama administration should announce its support for a permanent seat for India on the United Nations Security Council during Indian Prime Minister Manmohan Singh's visit to the White House next week," eminent scholar Ashley J Tellis, a senior associate in the Carnegie South Asia program, said. Carnegie contends that though it may not produce any immediate results, the bold declaration would highlight the growing importance of New Delhi to Washington, and the Obama administration's recognition of the evolving global power. "This announcement would be utterly consistent with the US president's own emphasis on multilateralism, and would acknowledge a reality that is simply inevitable in the current scenario, providing Washington with the diplomatic advantages of supporting New Delhi well before its membership became inescapable," Tellis argued. Tellis said that though India shares American concerns over Iran's nuclear ambitions, it has not been asked to do much about the Iranian program. The Obama administration should persuade New Delhi to pressurise Tehran to remain engaged in international negotiations, in hopes of achieving a peaceful resolution, he said. "Obama's nuclear security summit next year, will be a golden opportunity for the United States and India to collaborate on universal nuclear security standards, but New Delhi will need to overcome its misplaced anxieties about discussing its nuclear program in public," Tellis said. On climate change, he said the United States should give India access to priority technologies that could reduce its emissions growth. "India is not yet convinced that it can play an important role in combating climate change, and does not want to jeopardise its economic growth," he said, adding that economic progress and sustainable development are compatible, as little-noticed programs by the Singh government have proven. 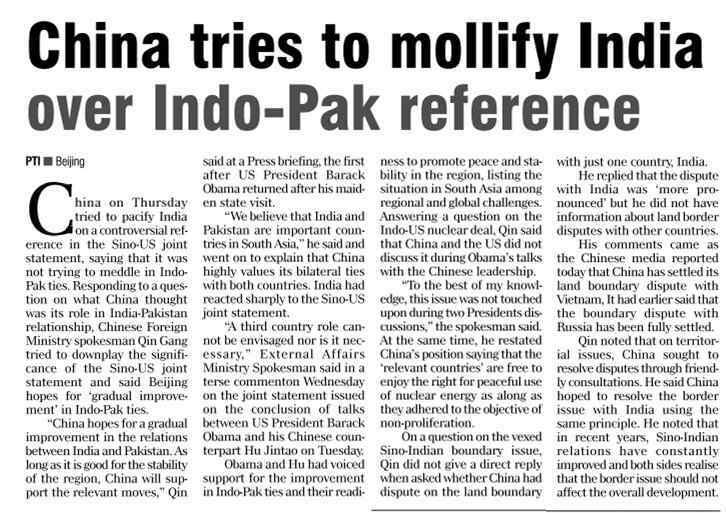 THOSE who doubted Chinese complicity in Pakistan's nuclear weapon programme should revise their opinion, at least now. The Washington Post's disclosure quoting Pakistan's top nuclear scientist Abdul Qadeer Khan about Beijing supplying the necessary design and enriched uranium to Islamabad to make two nuclear bombs in 1982 provides fresh proof of China's act of nuclear proliferation to help its "all-weather" friend. The proof is incontrovertible as it is contained in an 11-page note Khan prepared for Pakistan's intelligence agencies after he was put under house arrest in 2004 during the Pervez Musharraf regime. The note found its way to an old acquaintance of Khan, a Western journalist, and then to the Washington Post scribe, who gave a detailed account of China's dangerous role in Pakistan quickly realising its nuclear ambitions. 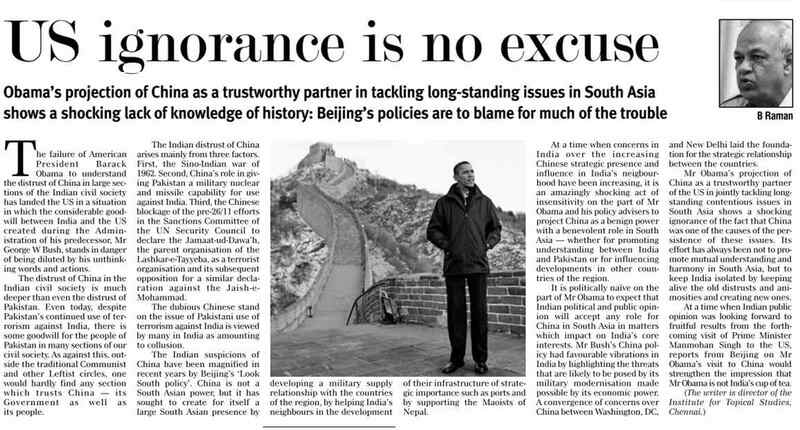 It is surprising how the US thinks China can be allowed a monitoring role in South Asian affairs. 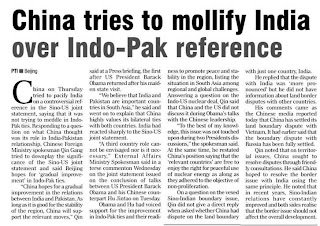 Ever since the signing of the Indo-US civilian nuclear deal Pakistan has been trying for a similar agreement with China after the US said "no" to Islamabad in view of its well-known nuclear proliferation activities. Pakistan has not succeeded so far, but it is hopeful of clinching a "civilian" nuclear deal with China any time in the future. As Pakistan Foreign Minister Shah Mahmood Qureshi stated a few days back, nuclear cooperation between the two countries was an "ongoing process". He indicated that if an accord on the lines of the Indo-US nuclear deal was not on the cards today, it might be there tomorrow. In the meantime, China has agreed to assist Pakistan to build two new nuclear reactors --- Chashma-I and Chashma-II. This is one of the achievements of Pakistan President Asif Zardari's recent visit to Beijing. It is time China's nuclear proliferation activities were exposed. China has been no less guilty of indulging in this dangerous game than Pakistan. If China had not provided 50 kg of weapon-grade enriched uranium to Pakistan in 1982, as part of a secret agreement reached in 1976 between the two countries, Islamabad could not be in a position to help North Korea, Iran and Libya to embark on a nuclear weapon programme. Libya has abandoned the race for the ultimate weapon, but the nuclear ambitions of North Korea and Iran continue to pose a serious problem. IT is happy augury that in recent times India has shed its reticence on exercising greater influence in the Indian Ocean littoral states, commensurate with its size and stature. The Chinese have been working systematically for years in their quest for maritime supremacy but India traditionally fought shy of it fearing that China would take it amiss. It is a measure of the new self-confidence of this country that it is now factoring in the maritime angle in a major way in its foreign policy choices. With the Chinese already well-entrenched in strategic terms, India, as a late entrant, has now much work to do to stamp its authority and influence on the region. For decades the world relied on the powerful US Navy to protect this vital sea-lane. But now India and China, with their enhanced economic clout, are moving to expand their control of the waterway. China has given massive aid to Indian Ocean nations, signing friendship pacts, building ports in Pakistan and Bangladesh as well as Sri Lanka, and even setting up a listening post on one of Myanmar's islands near the strategic Strait of Malacca. The Chinese involvement in Myanmar is particularly significant. Since the late-1980s, China has built naval facilities, radars and signal-intelligence posts all along the Myanmarese coast and in Coco Islands, which lie barely 18 km north of India's Andaman Islands. There was a strong suspicion in India at one stage that Chinese military personnel were stationed in Myanmar and were using these facilities to collect sensitive information on India. Mercifully, India swung into action in the early 1990s by wooing the Myanmar Government for military cooperation. The Myanmar navy sent its warship to Port Blair on a goodwill trip. The Myanmarese also offered to show Indian naval officials the "suspicious" sites to try to convince them that they were not working with China against Indian interests. In April 2008, India and Myanmar signed the Kaladan river transportation agreement that involves India's upgradation of Myanmar's Sittwe port. It has also made a proposal to build a deep-water port in Dawei.3. Yet, there can be little doubt that Myanmar continues to be a strong base for the Chinese navy. Rivalry between China and India has also emerged over exploration rights and access to Myanmar's energy resources. The increased naval cooperation between Pakistan and China in recent years and the development of the Gwadar naval base are of growing strategic concern for India. From Gwadar the Chinese can keep tabs on Indian activity in the Arabian Sea and monitor future US-India or US-Japan naval cooperation in the Indian Ocean. As for Sri Lanka, on its southern coast 10 miles from one of the world's busiest shipping routes, China is building a $1 billion port that it plans to use as a refuelling and docking station for its navy, as it patrols the Indian Ocean and protects China's supplies of Saudi oil. After Sri Lanka agreed to the plan, in March 2007, China showered aid, arms and diplomatic support on Sri Lanka in its war against the Tamil Tigers culminating in the virtual annihilation of that outfit. Bangladesh, with the help of China, test-launched its first C-802A anti-ship missile from a frigate in the Bay of Bengal in May last year. Commissioned in 1989, the 1,500-ton F-18 Osman is a Chinese-built Jianghu-class frigate. This is Dhaka's first C-802 missile test launch. China has an intimate relationship with Bangladesh's military. Much of its army, navy and air force consists of Chinese hardware. It is small wonder then that a 2004 Pentagon report had called Beijing's effort to expand its presence in the region as China's "string of pearls." Expressing concern in a speech earlier this year that naval forces operating out of ports established by the Chinese could "take control over the world energy jugular," India's then naval chief, Admiral Sureesh Mehta, had warned that "each pearl in the string was a link in a chain of the Chinese maritime presence." The fears are not misplaced considering that India imports 70 per cent of its oil needs through the sea route. Many Indian Ocean littorals like Mozambique, South Africa, Indonesia and Australia export coal to India. Others like Qatar, Malaysia, Indonesia and South Africa export natural gas to this country. Add to this our other maritime interests: almost 5 million Indians work in the Gulf and West Asia and the significance of the remittances they send home cannot be underestimated. The Indian Ocean is, therefore, vital to India's interests and the country can ill afford to let China have its way. India has to cover its flanks so that it is able to defend itself from a potentially-devastating blockade of the sea route under Chinese auspices. Evidence of a more pro-active Indian policy in the Indian Ocean littoral states is the manifest quest for stronger ties with Myanmar, Iran, Indonesia, Malaysia, Singapore and Oman, among others. The recent visit of Defence Minister AK Antony to the Maldives was designed to enhance Indian influence vis-a-vis China. India agreed to set up a network of 26 radars across the Maldives' 26 atolls, which will be linked to the Indian coastal command. In addition, India will also establish an air force station from where Dornier aircraft will carry out surveillance flights. The station will host Indian military helicopters too. India has also furthered its interests in the Indian Ocean Rim, which includes the islands of Mauritius, Maldives, Seychelles and Madagascar and the rim states of South Africa, Tanzania and Mozambique through economic sops like tax exemption treaty with Mauritius, and military inroads. Another Indian response to China's presence in the area has been the setting up of the integrated Andaman and Nicobar Command at Port Blair in 2001. That it caused anxieties in Beijing with regard to the security of its energy shipments is understandable. When in 2002 Indian Navy sea and air units under the command commenced coordinated patrols with the Indonesian Navy along the maritime boundary, it caused Chinese eyebrows to rise. In 2005, India began conducting similar patrols with Thailand in the Andaman Sea. All this has discouraged the tendency to take India for granted which was the case before this country began strengthening its defences and reaching out to Indian Ocean littoral states. India's plans in the Andamans include building naval bases, aircraft facilities, networked radar stations and even fixed underwater sensors at various locations of the island-chain. That Chinese naval analyst Zhang Ming recently proclaimed that the Islands of Andaman and Nicobar Archipelago could be used as a "metal chain" to block Chinese access to the Straits of Malacca is indicative of Chinese fears that India will no longer take things lying down. The Indian Ocean's strategic importance as the most important oil and trade shipping route of the world will increase still further in the coming decades when the galloping energy needs of India and China will account for more than half the growth of the world's energy consumption. From the Indian stand-point, such augmentation of Indian naval capability is imperative to deter China and to ensure that its maritime interests are not jeopardized. For a moment Dr. Manmohan Singh had us fooled. His repeated assurances that India wished Pakistan to stabilise and to prevail over the Taliban were beguiling. We took him at his word believing, like Goethe, that as "hatred in most societies is strongest and most violent in those where there is the lowest degree of culture", the cultured Indian Prime Minister meant what he said. Fat chance; Dr. Singh had to be badgered by the Americans for an assurance that India would not take advantage of the redeployment of two Pakistani divisions from Kashmir to the Afghan border having initially refused such a reconciliatory gesture on the grounds that India had 80 (Pakistani) nukes pointed at it. He had sought and apparently received "comfort" on this score from the Americans. The source of this tale is Seymour Hersh, admittedly not someone noted for his acquaintance with the truth but nevertheless a journalist of renown who backed up his assertions by quoting a number of Indian officials in sensitive posts in Delhi. Assuming that Hersh's version is not mere fiction — he is after all a Pulitzer Prize recipient and not a novelist — the question that arises is not why Dr. Singh finally agreed, but why he hesitated to do so in the first place. How, for example, would it further his professed desire to have Pakistan prevail over the Taliban, avowedly also India's enemy, if India continued to tie down Pakistani forces on the Kashmir border? Moreover, why was it necessary for Pakistan to await an assurance from India before redeploying a part of her army? After all, if India were to attempt a strategic land grab taking advantage of the absence of defenders, would that not risk a nuclear conflagration which, when last war-gamed, produced 100 million casualties on the Indian side (while all of Pakistan became a nuclear wasteland) and rendered large tracts of India uninhabitable? Would Dr. Singh, therefore, risk nuclear war for the sake of an additional few square miles of Azad Kashmir? Additionally, would the cerebral Dr. Singh allow himself to be outwitted by terrorists bent on triggering an Indo-Pak conflict if, or rather when, the next Lashkar-e-Tayyiba (LeT) terrorist attack is launched — notwithstanding that today Pakistan is now an even greater target of the LeT than India. A factor that the Hersh story illumines is the intrusive interest that the US has acquired into operational aspects of Pakistan's nuclear doctrine and the lengths to which it will go to "secure" these weapons. No option it seems is off the table. Also highlighted in the Hersh story is the mistrust that has developed between the two countries over the years, which has been reinforced by America's determination to extract Pakistan's cooperation in the war against al Qaeda and by the strategic alliance that the US has formed with India in which defence cooperation has the foremost priority. These developments have virtually ensured that Pak-US relations will, at some point of time, sour and even perhaps become adversarial. Already America's unpopularity in polls in Pakistan is almost as low as that of India. Obama's recent letter to Zardari asking him to "do more" at a time when some here feel Pakistan is already doing "too much" is another step in that direction. The subcontinent today is a tinderbox and any miscalculation or ill-considered action may ignite it. In the circumstances one would have liked Dr. Manmohan Singh to have willingly withdrawn Indian forces from the border to enable Pakistan to deal with the terrorists that he so loudly abhors. His diffidence begs the question as to why it is that India never misses an occasion to let slip an opportunity to improve relations with Pakistan. Interestingly, when India faced a similar threat on its north-eastern borders several decades ago, Ayub Khan offered the services of our army to defend India. Nehru's reply, "Joint defence against who?" ensured that never again would such an offer be contemplated, let alone made. Resultantly for the next 50 years the two countries have remained at daggers drawn. History is repeating itself only because while political leaders can be presented with opportunities, they cannot be made equal to them. India's unhelpful reaction to the predicament in which Pakistan finds itself, Delhi's half-hearted, staggered approach to addressing the many issues that plague relations, its condescending demeanour, its attempt to derive advantage from Pakistan's difficulties are grist for the mill of those who have a stake in keeping the two countries apart and wedded to confrontation. The prospects of a genuine reconciliation or, for that matter, progress in the composite dialogue has seldom looked so dismal. And if, following Dr. Singh's visit to Washington later this month, Obama and he emerge with a "strategy for dealing with Pakistan" that is reached without the participation of Pakistan, resentment between the two neighbours will further escalate. Stiff arming Pakistan, as India is doing, may not only prove self-defeating but self-destructive. For those who worry at the shape of things to come there is every reason to do so. Pakistan is on a collision course with the US as much as India. And while it will not matter who is to blame were it to occur, a little more understanding and a little less conceit on all sides may have perhaps averted it. But then, one supposes, those involved will have plenty of time to repent. Imphal, November 19 2009: Maj Gen Shakti Gurung, VSM , GOC 57 Mountain Division has handed over the baton of the GOC to Maj Gen Deependra Singh Hooda, VSM** while also welcoming Maj Gen DS Hooda, VSM** to 57 Mountain Division and promised him a very challenging but professionally satisfying command in the year ahead. A PIB (DW) release informed that Maj Gen D S Hooda, VSM** is a very highly qualified officer of the Indian Army who has been handpicked for the coveted command of the most professional Division of the Indian Army today. The General officer has qualified on the most prestigious courses of the Armed forces - an alumni of the Canadian Forces Command and Staff College as also the National Defence College, New Delhi he has served as the Chief logistics officer of a United Nations Mission in Asmara (Ethiopia) and other distinguished appointments in the Army headquarters. The General officer arrived with his wife Mrs Rashmi Hooda from Army Headquarters, New Delhi on November 15 to assume command of the formation. Maj Gen Shakti Gurung, VSM a dynamic and professional soldier needs no introduction to the people of Manipur. A very highly qualified officer in his own right, he has served as the Defence Attache in Myanmar and for the last thirteen months was one of the most approachable generals of the Division. His humane nature and the projects initiated under his able command for the betterment of Manipur and convenience of the people of the state needs no elaboration. The General was assisted in ensuring the successful completion of all the projects initiated by the formation by his graceful better half, Mrs Madhu Gurung as the Convenor of the Family Welfare Organisation of the Red Shield Division. Both the General and Mrs Gurung will leave a vacuum as they move to Army Headquarters, New Delhi, where the General will assume his next appointment in December, the statement conveyed. As he prepares to leave, Maj Gen Shakti Gurung, VSM requests the people of Manipur to be more proactive towards the process of peace and prosperity because without their will and support this will remain an elusive commodity. He thanks all sections of the society, Government officials and the media for the unstinted support provided to him for carrying out his tasks. The General and his wife said God Bless and God Speed as they wished the people of Manipur an abundance of GOD's blessings for peace in the days ahead coupled with prosperity and happiness, it added. Indian political leaders, writers and media analysts and intelligence agencies are past masters in creating doubts and misgivings between groups, communities, political parties and institutions to fan ethnic and sectarian tensions, political polarization and foment fissiparous tendencies in neighboring countries. They also excel in creating bad blood between the two neighbors or befriending the enemy of a neighbor. They have a chronic habit of twisting facts, distorting history and padding up their write ups with white lies to make their story juicy and scandalous. They shut their eyes to their innumerable internal weaknesses but worry about all their neighboring countries particularly Pakistan. They have all along spewed poison against Pakistan since Pakistan irks them the most. 62 years have lapsed since partition of India but Indians have still not got reconciled to the existence of Pakistan. They use propaganda as a tool to weaken Pakistan from within and to malign its image in the world comity. India has a penchant for collusive collaboration to discomfit its neighbors. It has all along connived and colluded with super powers to browbeat Pakistan. India's nexus with USA, Israel and western world enable them to easily sell their propaganda themes gainfully. In the aftermath of 9/11, India got an opportunity to cause grievous harm to Pakistan in close collaboration with USA, UK, Israel and Afghan regime under Karzai. Propaganda warfare was accelerated to smoke screen their clandestine operations for the fulfillment of their nefarious designs against Pakistan. Indian writers have been writing copiously to defame Pakistan and its institutions particularly the Army and ISI since these two institutions trouble them the most. Pakistan nuclear program has also remained an eyesore and their chief concern. Apart from their umpteen websites spitting venom, several fake websites are also in use to give impressions to the world that people of Pakistan themselves are wary of the rulers and the Army. They have been levying host of allegations and cooking up bizarre stories to make their stance appear authentic. • Pakistan was an artificial creation by Britain carved out of Indian Empire. • USA and China have used Pakistan as rental state to discomfit India. • Pakistan army calls the shots in Pakistan because of patronage by USA and China. • Pakistan Army colludes with USA and China for its own institutional gain and for pecuniary gains of the generals. • Pakistan generals are insensitive to the economic and social needs of Pakistanis. • Pakistan is sinking. It can be saved by people of Pakistan and not by Pakistan Army, or USA, China or India. • Pakistan Army is rabidly anti-India. • Indian public is strongly anti-Pakistan army since it indulges in Jihadi terrorism against India. • Pakistan Army is targeting only those selected Taliban that had hit military targets. • Western analysts perceive Pakistan Army as the glue which holds Pakistan together but India thinks otherwise. • Pakistan Army suffers from medieval mindset, is retrogressive and prevents Pakistan from turning into modern democratic Islamic Republic. One. Provoke Pakistanis and turn them against Pakistan Army. This has become necessary for India under the sudden changed environment when the image of the Army has shot up sky high and the whole public and all political parties are fully backing up the army in its bid to get Pakistan rid of the foreign sponsored scourge of terrorism. Two. Create rift between public and the army and provoke it to come on the streets against the army. Three. Force the government to stop the military operation in South Waziristan which is nearing completion, or provoke it to target friendly tribesmen like Maulvi Nazir and Gul Bahadur led tribesmen. Four. Pakistan Army is not under the control of civil government. Five. Create bad blood between Pakistan-USA and Pakistan-China. I hazard to put the jaundiced views of Subhash in correct perspective. He describes Pakistan as an artificial state oblivious of the fact that the British had wrested control of India after fighting the Muslims for over a century. But for treachery of Hindus in Battle of Plassey in 1757, battle of Seringapatam in 1799 and war of independence in 1857, the British could not have established their empire. The Muslim rulers ruled Indian subcontinent with full authority for nearly 1000 years, starting from the reign of Muhammad Bin Qasim in 712 AD. At no stage the Hindus posed any challenge to their rule. Rather they remained most loyal and humble subordinates for which they were duly rewarded. While the Muslims resented and resisted British rule, Hindus became their natural allies and both went about persecuting the Muslims and reducing their nobility to serfdom. Despite their ruthless persecution, the Muslims retained their religious identity. All India Muslim League emerged as a platform to protect interests of Muslims of India. Charismatic Muhammad Ali Jinnah in tandem with Allama Iqbal not only prevented the Muslim canoe from capsizing in the turbulent ocean of hegemonic Hindu India duly patronized by the British, but also made phenomenal efforts to navigate it safely to the shore of independence. Britain had to abdicate in hurry since it had got economically exhausted after 2nd World War and freedom movements had erupted in all its colonies including India. British-Hindu combine strove hard to keep India united under Congress tutelage but so high were the sentiments of Muslims of India that the British were left with no choice but to acquiesce to Jinnah's demand to partition India. Jinnah had to contend with moth eaten and truncated Pakistan loaded with countless problems. Indian leaders accepted the partition plan with a heavy heart but nurtured the fond hope that sooner than later it would revert to Indian Union. It would have collapsed under the weight of Indian intrigues within six months as predicted by Indian wizards if it had been an artificial state. When Pakistan stood up on its own economic legs and surprised the world, India stepped up its subversive activities to keep Pakistan politically unstable and economically weak. It achieved its first major success in 1971 when it cut Pakistan into two with active assistance of former USSR. It is now working hard to disintegrate rest of Pakistan and has launched massive covert operation in connivance with USA, Israel, Britain and Afghanistan from Afghan soil. Fanciful stories of balkanization and breakup of Pakistan have been published by Indian and western media since 2004 and Balochistan, FATA and major part of NWFP inflamed. All out efforts are now in hand to destabilize Punjab. Having taken all possible steps to sink Pakistan, Subhash pretending to be a well wisher of Pakistan intriguingly asks as to how Pakistan should be saved from sinking. In his view USA, China and India are possible saviors, but then hastens to add that situation in Pakistan is so bleak that even these countries will not be able to save it if people of Pakistan are not interested in saving their country. He mocks at Pakistanis by saying that if they are not interested in saving Pakistan, why should India bother whether it should float or sink. He then gives a sharp twist to his weird story by lumping USA with China in one basket and terming both as imperialist powers having exploited Pakistan by using it as a rental state to serve their strategic interests. He asserts that both had provided arms to Pakistan to discomfit India. He forgets that USA has all along vied to befriend India even when Pakistan was its most allied ally and India was the strategic partner of Soviet Union. This tilt became pronounced when the Democrats under Kennedy came to power in 1961. The US and western countries rushed heavy consignments of arms to India when it was clobbered by China in the 1962 border skirmish, well knowing that its chief mentor Moscow was already providing arms to India. Inflows from two camps tilted the balance of power in favor of India. As far as China is concerned, it had maintained excellent relations with India till as late as 1960. Hindu-Cheeni Bhai-Bhai was a popular slogan of that era. China-Pakistan relations were strained because we had joined SEATO and CENTO. Indo-Sino relations got frosty because of unwise forward policy pursued by Nehru and his aggressive intentions concerning Tibetan Himalayan region. It was essentially because of hostile policy of India, Soviet Union and Afghanistan and US tilt towards India that Pakistan was forced to lean on China in 1960s. USA betrayed Pakistan by ceasing supply of critical spare parts during the 1965 Indo-Pak war not realizing that Pakistan was totally dependent upon US weapon systems. On the other hand, Indian forces equipped with Soviets weapons continued to receive uninterrupted flow of arms from Moscow. Similar treatment was meted to Pakistan during the 1971 war in which USSR was fully backing Indian war effort. The US never came to the rescue of Pakistan when it was splintering as provided for in 1959 Karachi Agreement. The US and Canada helped India in becoming a nuclear power in 1974. Pakistan on the other hand was prevented from acquiring nuclear capability. Soviet Union became the biggest arms supplier of India and with its active assistance. India upgraded its naval arm and vied to convert Indian Ocean into Indian lake. RAW in collusion with KGB and KHAD indulged in relentless sabotage activities against Pakistan throughout 1970s and 1980s. Throughout this period when Pakistan was enjoying best of relations with USA owing to Afghan war, neither USA nor China initiated any hostile acts against India. This was despite the fact that India was enmeshed in dozens of separatist movements and insurgencies and had plentiful vulnerabilities to exploit. Pakistan in fact never exploited India when it was weak. One example was when it was critically embroiled with China in 1962 war. Some hawks within the Establishment were in favor of activating Kashmir front but Washington advised Ayub Khan to show restraint arguing that it would mellow down India and pave the way for resolution of Kashmir dispute. Suspecting that Pakistan was secretly indulging in nuclear program, USA punished Pakistan in 1979 by imposing harsh sanctions. Sanctions under Pressler Amendment were applied in 1990. Another set of sanctions were levied in the wake of our nuclear tests in response to Indian tests in 1998. Additional sanctions were applied in 1999 when Gen Musharraf staged a coup and took over power. In fact Pakistan has been the most sanctioned country in the world. Whenever USA doled out aid tied to stringent conditions, Pakistan had to pay a very heavy price. Pakistan never gained from US aid but was always a loser. Even now Pakistan is losing on all counts despite the propaganda that US is giving huge dozes of aid. As against $10.5 billion given over five years (2002-07), Pakistan lost $35 billion. Social costs were even more pronounced. All its sacrifices to fight US war on terror have gone down the drain under the mantra of 'do more' and libelous allegations. Pakistan Army and ISI in particular have been victimized on false charges. While pretending to be friend of Pakistan, USA is stabbing Pakistan in the back. Kerry-Lugar Bill, which is anti-army, is another ploy to make Pakistan subservient to its wishes. Its chief wishes are denuclearization and balkanization of Pakistan and turning it into a vassal state of India and making India a proxy super power of the region. In contrast to the aggressive and double game of Washington against Pakistan, it has gone out of the way to please India which is its real strategic partner. It has showered India with dozens of lucrative endowments in the form of economic agreements, military deals and civil nuclear deal. Israel has now become the biggest supplier of sophisticated armaments to India. The trio is interlinked and has formed a deadly nexus to harm Pakistan. Lavish supplies have radically swung the military balance in favor of India but India is still wailing as to why Pakistan is receiving some equipment for counter terrorism which it perceives will be used against India. It will get satisfied only when Pakistan gets over awed by the burgeoning military might of Indian forces and surrenders its sovereignty. Apart from forging strategic relations with USA and becoming its pawn, India has built close economic and military ties with China and trade is spiraling fast. With this background, it is rather strange on part of Subhash to dub USA and China as dangerous imperialist powers with which India enjoys best of relations. The only reason for this outburst could be the recent joint statement made by Obama and Chinese President in Beijing that the two are ready to play a part in finding a just solution to Kashmir dispute. It has really shocked and discomfited India since it doesn't want any third party to interfere in 62-year old unresolved dispute which India is unprepared to resolve. If there is any country in the region that is being maltreated, it is Pakistan. But for the Herculean efforts of Pakistan Army and the ISI, the plot makers sitting in Kabul might have succeeded in their nefarious designs. These two institutions have played a commendable role in defeating series of dangerous plans to destabilize and denuclearize Pakistan. While the ISI under Lt Gen Shuja Pasha unearthed RAW and CIA racket and took effective counter measures to block their forward advance towards sensitive areas, the Army under the radiant leadership of Gen Parwez Kayani launched dazzling operations in Malakand and Swat and now in South Waziristan and gave a death blow to the overall plan hatched by our adversaries to irretrievably embroil Pakistan Army in an un-winnable war against well, trained, well equipped and well-motivated militants and defeat it. Clinching evidence of deep rooted involvement of RAW, RAAM and CIA in Swat, Waziristan and Balochistan has come to light. Enormously large caches of arms and equipment with Russian and Indian markings have been found from tens of caves, tunnels and houses. These agencies had been funding, training and equipping the members of Tehrik-e-Taliban since 2002 and after their several encounters with the Army they were very confident that South Waziristan would prove to be graveyard of Pakistan Army. Defeat of the army would have cleared their path towards the realization of their objectives. However, the reverses and dismantling of forts of Swat, Bajaur and South Waziristan have flabbergasted the schemers. They could not imagine in their wildest dreams that impregnable South Waziristan held by Hakimullah led Mehsuds and foreigners would collapse within one month. Over 90% of the area, including the critical space formed by Srarogha-Ladha and Makeen has been captured. Their investment worth billions, time and effort at the cost of their primary task of stabilizing Afghanistan has gone waste. Above all, their immoral acts against an ally stand exposed. Worst of all, Afghanistan is slipping from under the feet of US-Nato forces. Return of Taliban under Mullah Omar now appears to be a real possibility. Sudden reversal of tide has unnerved India since exit of US forces in not too distant future would render its stay in Afghanistan untenable. If such a thing happens, which no more seem unlikely; India will be the biggest loser. All its high sounding plans would come down like a house of cards and its huge investment of over $2.5 billion in Afghanistan and colossal amount spent on fruitless covert operations would go waste. There will be many questions asked at home about this squandering. Subhash is having severe gripes in his stomach as to why Pak Army did not simultaneously grapple with Hakimullah Mehsud, Maulvi Nazir, Turkistan Bhittani and Gul Bahadur in South and North Waziristan. Plot makers had hoped that militant forces would put up a united front to make the task of Pak Army difficult and complicated. Since these tribal leaders decided to stay neutral and the Army used their areas as bases of operations for launching operation against the defiant Mehsuds, Subhash chose to cast aspersions on the Army by alleging that it is nurturing Islamic fundamentalist terrorists. He turns a blind eye to the well-known linkage of Indian senior officers with Hindu terrorist organizations and their joint efforts duly supported by RAW to target Indian Muslims. ISI has been wrongfully blamed for the crimes committed by Hindu terrorists. Indian Army has become a blot on the face of shining India since its officer cadre is indulging in all sorts of immoral acts including rapes, drugs, smuggling and kickbacks in defence deals. Over 15 lacs security forces are fighting the insurgents and separatists in different parts of India for the last five decades but have been unable to defuse even a single movement. Majority of Indian nuclear and missile sites are located in the most troubled zone of India called Red Corridor, which is ungovernable. All the five partners in crime are suffering from acute depression because of the changed circumstances. Their excitement of seeing the endgame to their liking has fizzled out like a damp squib. Growing chatter in Indian media dwelling on breakup of Pakistan has got muffled. They are holding Pakistan Army responsible for turning their jollity into sadness and ruefully admit that but for this glue Pakistan would have certainly splintered, or at least they would have stolen the nukes. They seem to have lost their sense of balance and in utter frustration and sheer exasperation started to expectantly look towards people of Pakistan to do what they could not do for the last eight years. Subhash shows them the way and prods them to emulate the example of legal fraternity and civil society that had succeeded in first ousting Gen Musharraf and then restoring chief justice of Pakistan. He urges them to bring Pakistan Army under effective civilian control, implying that presently it is not. He forgets that India was quite comfortable with Pakistan Army when it was commanded by President Gen Musharraf who had arrogated all powers to his seat. India had in fact drawn maximum advantages from Pakistan during his rule. It is even now vying for his return to power so that Kashmir dispute could be settled in accordance with Indian wishes. Both USA and India are not happy with Pakistan Army under Kayani since it is guarding national interests with utmost devotion and unwavering resolve and keeping the hostile forces within and without at bay. The duo gets flustered when their dictates instead of being promptly obeyed are questioned and parried. Subhash has cleverly absolved the government and all other institutions of Pakistan but has made Pakistan Army his sole target for neutralization and that too by the people of Pakistan. He slyly attempts to forge friendly relationship between peoples of India and Pakistan by asserting that Indian public is anti-Pakistan Army and not anti-Pakistan. I may like to draw his attention to a clip on website in which a Hindu girl not more than 12 years old is demonizing Pakistan and its people and earnestly wishing death of Pakistan. It gives an insight to the Indian mindset how ardently they hate Pakistan. Hatred is being systematically nurtured into the minds of the Hindu youth. The hard reality is that India doesn't want to play a role to save Pakistan but to sink Pakistan. Dr. Subhash Kapila has put up a poor show in futilely trying to instigate the people of Pakistan to rebel against their own Army that is making them proud. It has won the hearts and minds of people of Swat where normality has returned and is now all set to help rehabilitate displaced people of South Waziristan. Kapila's prodding might have cut some ice had this theme been sold during the dark period of Gen Musharraf when sentiments against the Army had risen. He has belled the cat at the wrong time since he seems to be suffering from paranoia as well as schizophrenia. I pray for his early recovery from these deadly diseases. PUNE: Chief of Army Staff (CoAS) General Deepak Kapoor said that the situation along the Line of Actual Control (LoAC) with China remained generally peaceful, contrary to what was being projected. The Army chief was speaking on 'India's national security challenges in the next decade,' while delivering the annual General BC Joshi memorial lecture at the department of management sciences auditorium, University of Pune (UoP) here on Wednesday. The lecture was organised by the department of defence and strategic studies and was facilitated by Headquarters, Southern Command. Gen Kapoor pointed out that presently China is pursuing its long-term political goal of developing its comprehensive national power. He said, "Our multi-dimensional engagement with China is predicated on the recognition that these two rapidly developing and transforming nations need to come to terms with the rise of one another. It is in this context that bilateral relations, despite the unresolved border issue, have strategically grown." However, there is need to take note of the likely implications of the improvement of infrastructure in Tibet, rapid modernisation of its armed forces, strategic initiatives in Bay of Bengal and Indian Ocean region, proliferation of nuclear/missile technology to Pakistan and expanding military and economic relationships with countries on our periphery, which could impact India's security calculus in the long run, he added. On Pakistan, the General said that Islamabad today presented a grim picture of a state in rapid decline. The current environment of political uncertainties, escalating militancy, violence, radicalisation of society and tribal complexities is severely undermining the state of Pakistan. 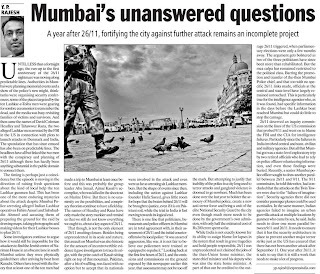 The Mumbai terror attack and the responses thereafter have amply exposed Pakistan's complicity, in its continued perpetration of state-sponsored terrorism in India, he maintained. The General said that the increasing role that non-state actors like Al Qaeda or Lashkar-e-Taiba are playing in shaping global dynamics, have rendered traditional state boundaries less relevant. 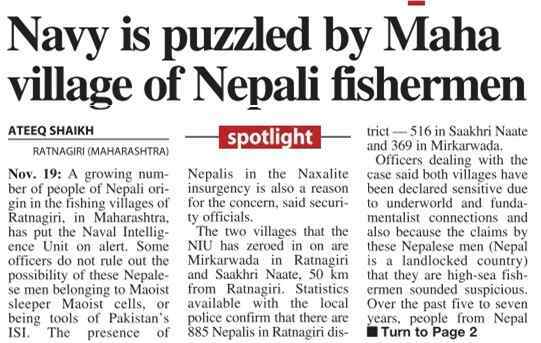 And this is posing a serious challenge to state authority and leading to realignments in India's neighbourhood. Shifting focus to terrorism and left wing extremism, he said that there has been a marked improvement in the security situation, primarily on account of the moral ascendancy gained over the terrorists by the security forces. 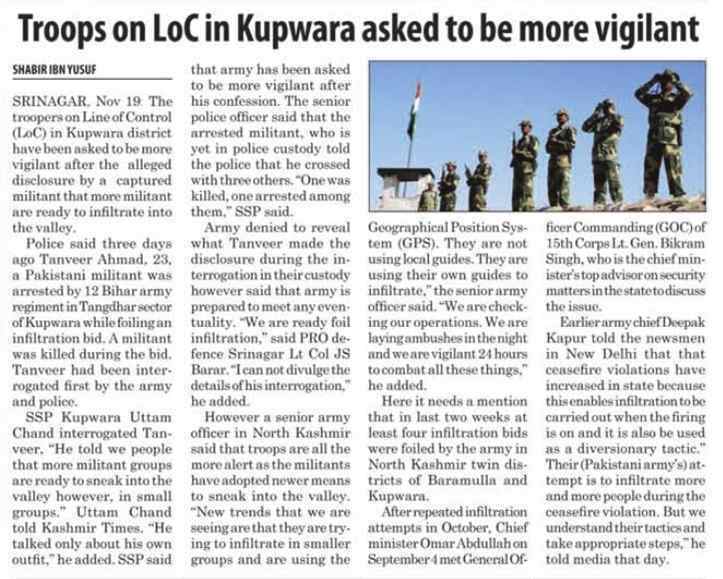 In the North Eastern States, relentless operations by the security forces have kept the situation well under control. Most parts of the region are free of violence and normalcy has been restored, he added. The disruptive activities and spread of Naxalites in around 14 states poses a major security challenge. The government has adopted a multi-dimensional and integrated approach to counter this menace, he said, adding, "Since it is socio-economic class struggle, direct involvement of the army is not mandated." This month's tragic — and probably preventable — mass shooting at Ft. Hood, Texas, certainly raises questions about why a lone shooter was able to unload not one but several magazines of ammunition over a several minute period – shooting and wounding more than 30 soldiers and killing 13, at a heavily restricted US Army base. Just as legitimate questions were raised following the mass killings on the Virginia Tech campus in 2007, both military personnel and civilian citizens alike ought now to be asking of themselves and our elected and appointed leaders, not only whether the perpetrators of such carnage could reasonably and appropriately have been identified in advance and prevented from carrying out their obviously well-planned mass murders; but also, whether it makes sense to disarm a captive group of citizens (at Virginia Tech, the student body; at Ft. Hood, the military personnel assigned to the base). In the case of Ft. Hood, it is important to bear in mind that since 1993, thanks to a policy ordered by then-President Bill Clinton, it has been essentially unlawful for individuals on military bases to carry firearms unless they are military police, or are training in firearms at a firing range. Many of those who support this gun-free military base policy have reacted to calls to review it, by simply echoing the standard refrain of gun-control advocates that, "we don't want everyone on a military base running around with a gun on their hip." (Of course, had this been the case at Ft. Hood, it is doubtful Maj. Hasan could have squeezed off more than a couple of rounds before being himself felled by an armed soldier.) It is a false dichotomy that we either allow no one (except MPs) or everyone on military bases to possess firearms. Rather, the debate should center on why is it made virtually impossible for any soldier on a military base to carry arms, even if they have in fact been properly vetted and trained in their use? Why, after all, should a citizen be forced to surrender his or her right to keep and bear arms, simply because they have entered military service; service expressly supposed to teach the proper and safe use of firearms? In the case of the students at Virginia Tech two years ago, it was Virginia legislators who decided to disarm them and make them sitting ducks for a single crazed gunman, Seung-Hui Cho. For the military victims at Ft. Hood this Fall, it was three commanders-in-chief (Bill Clinton, George W. Bush, and Barack Obama), and a series of politically-correct base commanders, who rendered those who serve under them vulnerable to an apparent religious zealot bent on killing as many of his fellow service men and women as he could. Continuing to stick our heads in the sand and refuse to even reconsider amending such policies as those that apply to campuses in Virginia (and other states across the country) and at Ft. Hood (and virtually every other military post across the country), vastly improves the chances that our students and our military personnel will be victims of other deranged individuals in the future. NEW DELHI: With four generals and several other officers coming under the scanner in the probe into the alleged Sukna land fraud case, the government has warned the Army to clean up its act and cancelled the appointment of one of the accused as the new deputy chief. The case has also led to an unseemly controversy within the top Army brass, with some quarters holding that a turf war is raging between the present Army chief General Deepak Kapoor and his likely successor, Lt-Gen V K Singh, chief of the Kolkata-based Eastern Army Command (EAC) at present. The court of inquiry (CoI) into the alleged scam, at the Sukna military station in Darjeeling district of West Bengal, is being conducted at Kolkata under the operational jurisdiction of Lt-Gen Singh, who is slated to replace Gen Kapoor as Army chief on March 31 next year. Interestingly, one of the generals questioned by the CoI, Lt-Gen Avadhesh Prakash, is one of the principal staff officers of Gen Kapoor as the military secretary (MS) at the Army HQ here. Moreover, the defence ministry has also cancelled the appointment of Lt-Gen P K Rath, who was `attached' to the EAC last month since he was the commander of the crucial 33 Corps based in Darjeeling district when the alleged land scam took place earlier this year, as the new Army deputy chief (information systems and training). A search has now been launched for a fresh panel of names to be submitted to the Appointments Committee of the Cabinet (ACC), which had earlier cleared Lt-Gen Rath's name as the deputy chief from November 1. 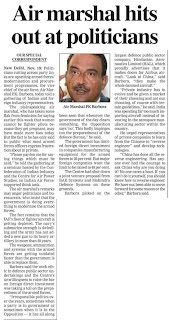 Defence minister A K Antony, on his part, has asked the Army to finish the CoI and fix responsibility at the earliest in the land case, which revolves around the grant of a no-objection certificate (NoC) to a private education trust, posing as an affiliate of the Ajmer-based Mayo College, to acquire a 70-acre tea estate adjacent to the Sukna military station. Antony has clearly told the Army that such cases "not only damage the Indian Army's image'' but also "adversely affect the ability of senior officers to measure upto the expectations of the men they lead''. The others examined in the Sukna case CoI include Lt-Gen Ramesh Halgali, who is commanding the 11 Corps at Jalandhar at present, Major-Gen P Sen, a brigadier and two colonels, among others in the `chain in command' when the alleged case took place. Incidentally, Army authorities had initially rejected the NoC to the private trust but the decision was later overturned. Antony, in his letter to the Army, expressed the worry that the involvement of senior officers in such cases would "weaken the ability of the armed forces to ably handle ever-increasing security challenges''. The Army should, therefore, ensure that a loud and clear message is sent that corruption will be "dealt with absolute sterness and promptness''. The declining standards of probity and discipline in the armed forces have been underlined by a series of meat, cereal, liquor and fuel scandals. So much so that a major-general has faced the music for even sexual harassment in recent times. The court martial against Maj-Gen A K Lal, removed as commander of the strategically-located 3 Infantry Division at Leh in September 2007 after a woman officer accused him of "misconduct'' and "misbehaviour'', held that he should be dismissed from service. Incidentally, the names of two Lt-Generals, four Maj-Gens, nine Brigadiers, a Navy Commodore, two Commanders, a Lt-Commander, an IAF Group Captain and a Coast Guard DIG had figured in an earlier list of 21 senior officers facing corruption charges tabled by Antony in Parliament. New Delhi, Nov 19 (IANS) Twenty women officers of the Indian [^] Army Thursday sought to know from the Delhi High [^] Court why they were discriminated in service vis-a-vis the men when both got similar training. Rekha Palli, counsel for the woman officers, submitted before a division bench comprising Justices Sanjay Kishan Kaul and M.C. Garg: 'It has been 60 years of our independence but still our mindset has not changed a bit and discrimination against women is still rampant. 'When men and women get the same training with same educational standards, then why women officers serving in short service commission cannot be granted permanent commission,' Palli asked. Challenging a July 2006 policy of the army, Palli said that there was one set of rules for women officers inducted into the army. She said when the time came for extensions, they were promised they would stay on in the army but this never happened. The court asked the government to submit by Dec 14 a performance chart of men and women while on duty. The court was hearing the plea of the women officers who have filed a public interest petition challenging the government's proposal of Sep 29, 2008 to bypass them for future grant of permanent commission. Currently, women are inducted into the army as officers under the Short Service Commission for a maximum period of 14 years. Their male colleagues are eligible to receive permanent commission after five years.